Straight off – This Cherry Blossoms mobile slot is strangely pretty. We say strangely because once you look past the cherry blossoms and the lovely Japanese ornaments, you lay eyes on the Geisha and think… is that a boy or girl Geisha? Ugliness of the main character aside, the graphics and sounds are pretty enough to keep you entertained and the free spins are triggered often enough to make them worthwhile. This 5 reels, 20 payline mobile slot from NextGen can give you up to 25 Free Spin games, which can also be re-triggered. That’s a lot of free spins. Not only that but all your winnings have a 3x multiplier. That’s worth a walk in the beautiful Japanese garden with a companion who might or might not be a girl. But hey, as long as we are all having a good time, that’s what counts right? Wild Symbol: The Geisha is the wild symbol, substituting all symbols except the mask symbol and doubling any winnings. 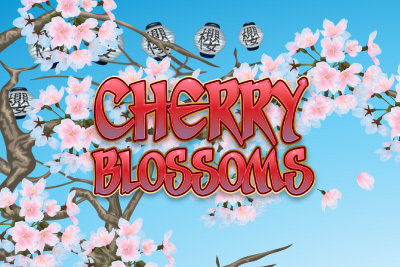 Free Spins: 3, 4 or 5 scattered cherry blossoms trigger the free spins feature, triggering a wonderful 15, 20 or 25 free spins where all wins are tripled. They can be retriggered, meaning you could potentially get 50+ free spins. Cherry blossoms and beautiful night gardens, this is an above average slot machine in look and feel. It’s a little temperamental with different mobile phone and tablet devices, but a great free spins bonus feature raises this mobile slot above the rest.